This Guidebook is designed for anyone who’s new to magic tricks, Conjuror Community (CC for short) — and for those seasoned magicians who want a refresher course on the proven path to amazing magic. This is your roadmap to practical, repeatable, reliable astonishment in any and every situation. …sometimes it seems impossible to keep up, much less move forward. Whether we’re just starting out, or we’re lifelong professionals, we’re all looking to make the most amazing magic we can, and bring the maximum level of joy and astonishment to all those who see our magic tricks and share our passion. In it, we’ll reveal our most cherished secrets. 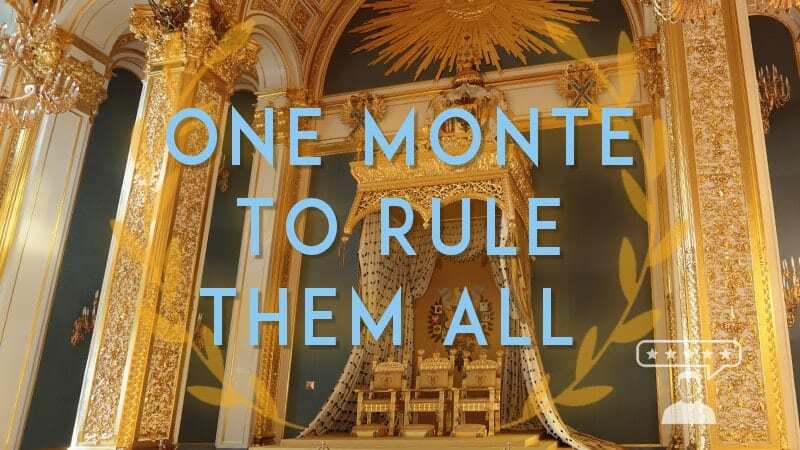 In fact, all the secrets you’re about to discover boil down to the biggest secret of them all. You’re about to discover a practical, repeatable formula that will allow you to transform even the most disinterested audience into astonished, raving fans that don’t just like — but love your magic tricks. This is the same system the world’s greatest magicians use to create predictable astonishment in any and every situation. It’s the method David Blaine uses when he performs at private parties. It’s the same system Juan Tamariz uses to convert strangers into Super Fans when he walks into a town where no one knows his name. This system works if you’re just getting started in magic and you don’t have many, or any, skills. It works if you are getting older and your hands aren’t what they used to be. It works if you’re a sleight-of-hand expert, too. It works whether you like to do magic tricks with ordinary cards, or everyday objects. It works if you only love mind-reading and mentalism. It works whether you want to perform close-up or if you love the stage. It works if you want to perform just for old friends, new friends and family. And it works just as well if you want to amaze audiences you’ve never met who don’t seem very interested in magic tricks at all. No matter your ‘magician profile‘… This system works because it cuts through the confusion and leverages the 3 fundamental, but little known, methods that drive successful performances with ANY magic tricks. We call it the Strategic Astonishment System (SAS for short). Read this Guide carefully. Bookmark it and return to it anytime you need a refresher. You won’t find this stuff in any magic download, book or video… anywhere. Learn the Steps to Strategic Astonishment and Turn Your Magic Tricks Into Routines! This Flowchart outlines the Strategic Astonishment System. Download a PDF version below. Print this PDF version and pin it to the wall in your magic room. 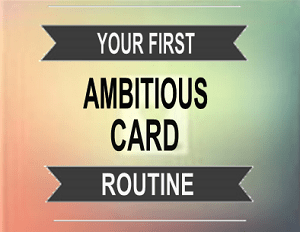 Use it as a roadmap to turn your magic tricks into routines! If you intend to deploy Strategic Astonishment, you’ll want to reference it often. When you’re learning new sleights, tactics and magic tricks with cards, coins or anything else, you’ll need constant reminders to make sure the SAS stays at the front of your mind. Otherwise, you’ll be wasting lots of money and time – your most valuable resource. Important Warning: Most magicians learn the hard way that there’s little value in understanding sleights like the double turnover, or even a simple card control, in and of themselves. However, the value in understanding how to apply these specific tactics to the Strategic Astonishment System is priceless. Magic Tricks are pretty simple. 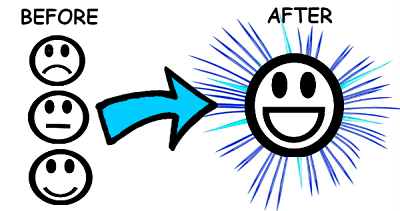 Our job - what professional magicians get paid to do - is to move people from a “Before” state to the “After” state we desire. In the “Before” state, any audience is filled with people in all kinds of moods. Some are happy, and some are sad. They might be bored, tired or totally indifferent for a wide variety of reasons. In the “After” state, they feel MAGIC. They are entertained. They feel happiness, joy and a state of wonder. For at least a short time, their worries are forgotten, and they experience delight. They love to be taken on an exciting journey - filled with thrills and exciting surprises. They the love to experience the “After” state. The best Magic Tricks work because they move people into that state. In magic, the ‘After’ state has many names, but we like to call it ‘Delight’. And great magic simply takes them from whatever “Before” state they are experiencing to the “After” state of ‘Delight’. Let’s face it. Some magic tricks just aren’t very magical. But even the best magic trick fails if we use it in the wrong situation. As a magician, you will be called upon to ‘show your stuff’ in all sorts of situations. You may have your ‘close-up case’ in the car, or you may be handed a deck of cards at a dinner party. Even if you’ve been interested in magic for only a few months, you probably know what it's like to be put on the spot and feel totally unprepared to amaze. When you begin to select your magic tricks for strategic value, you’ll want to choose tricks that will serve you in a wide variety of situations. Almost NO trick plays extremely well in every combination of Audience, Situation and Setting. However, you CAN ensure you have perfect material at your fingertips anytime you need it. That’s why we created the Environment/Materials Grid. Before you decide to learn any more magic tricks, go through this exercise. It’s designed to leverage the first irrefutable Law of Amazement and Increase the number/variety of situations where you are prepared to create miracles. Your Key Performance Environments are the settings where you will find yourself (most of the time) when you want to amaze. Your Potential Materials are the objects you’ll use to make magic in the Performance Environments you selected. You can also just draw this out on paper in front of you at home. Seriously - don’t just read through this, take action and physically WRITE your ideas down. You’ll be amazed at how much this one little physical action will do to solidify these ideas and supercharge your magic right now. Get your table going and continue reading for a full explanation below. 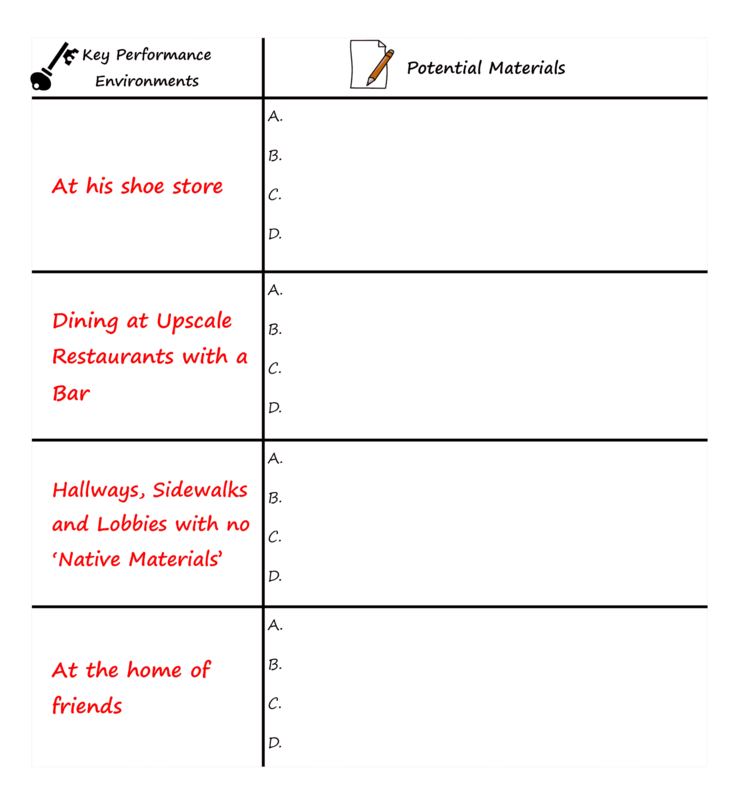 Choose Your Key Performance Environments: Where do you want to amaze? The goal here is to focus your energies on 3-5 Performance Environments that cover a clear majority of the settings where you want to perform. In a perfect world, we’d all like to be able to astonish anytime, anywhere - even naked and in the woods. But Strategic Astonishment is all about making smart choices that drive consistently great outcomes for your magic. Years of testing have shown that limiting your choices to 3 to 5 Key Performance Environments can give you great results in 80%, or more, of the situations you’ll encounter. You’ll likely discover that many of your ideal magic tricks work perfectly, or very well, in most of your Key Performance Environments. For example, we’ve worked with Mike for a little over a year. He’s 48, owns his own business (a shoe store), and he’s a member of our Conjuror Community Club. He’s chosen 4 Key Performance Environments that will serve him in 90% of the situations where he wants to perform. As you can see, Mike has chosen his Key Performance Environments based on actual situations that arise in his life. He’s often at the store, working with customers and employees, or dining out (or in) with friends. He’s also pinpointed a common scenario where many magicians find themselves totally at a loss: Hallways, Sidewalks and Lobbies with no Native Materials. Mike has wisely discovered that he needs magic tricks he can show people when he’s out and about. What objects (materials) do you want to use in your magic tricks? To pick the perfect trick for any situation, you’ll need to make sure you have easy access to the specific materials needed, in the specific situations where you need them. or ANY object you would like to use in your magic. 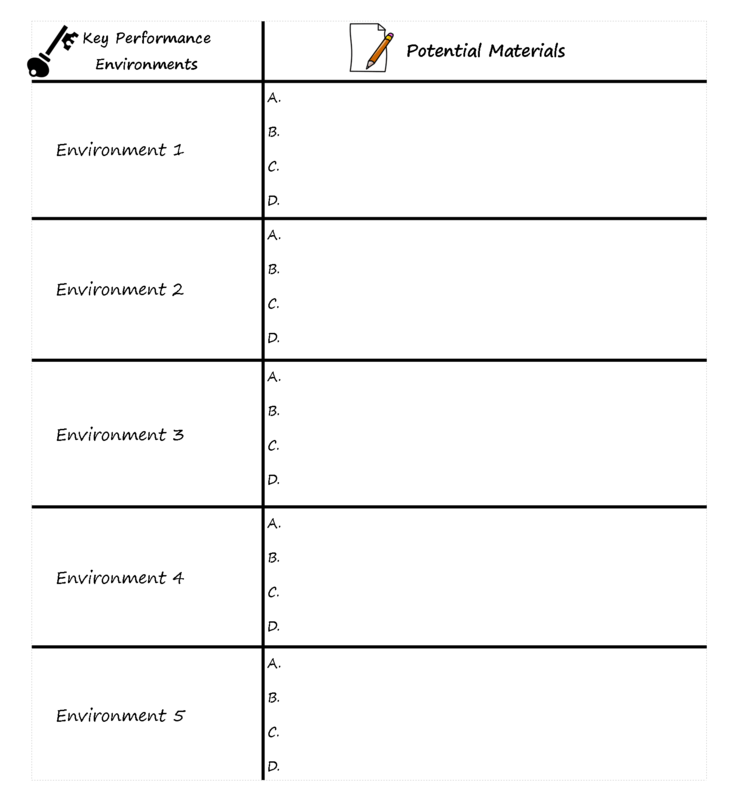 To complete your Environment/Materials Grid, use your new Materials List to fill in the grid with all the objects you might rely on in each Key Performance Environment. Most Performance Environments come stocked with many Natural Materials you can rely on. For example, Restaurants and Bars always have napkins, forks, glasses and cups. A person’s home will normally have at least a book or two. ...and bring the appropriate Materials with you when you suspect you will be in one of your Key Performance Environments. 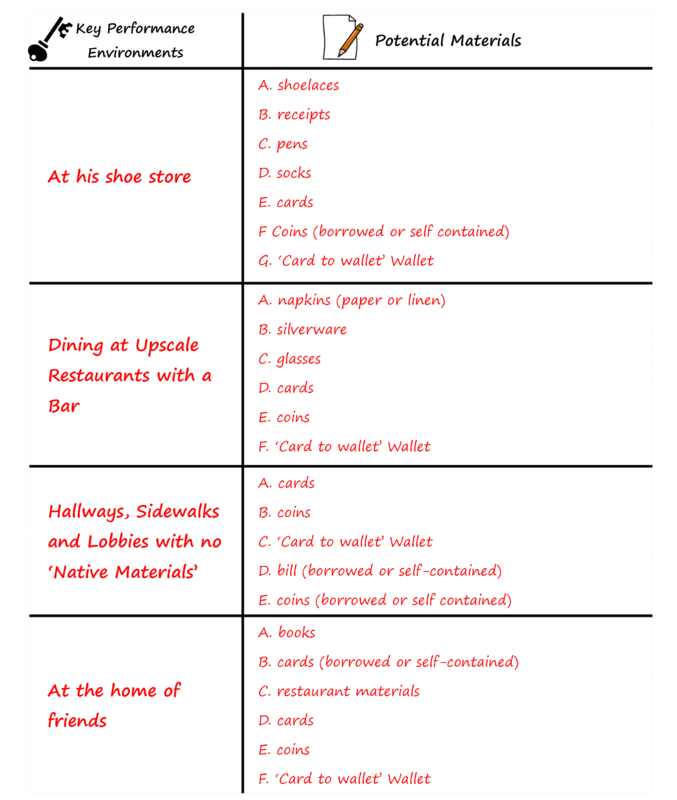 Mike used this information to fill out his grid. He often carries a deck, his ‘card to wallet’ (which doubles as his regular wallet) and his four trusty silver dollars. 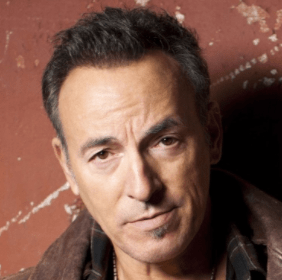 They allow him to perform many of his favorite magic tricks and routines in any situation. He’s also seen a couple great opportunities for tricks that use the items he uses every day at his shoe store. His store is his home turf. Much like his own home, his store is an environment where he can completely control his available materials. That means just about anything that might naturally be found there can be prepared in advance - pens, receipts, shoelaces and rubber bands can all be preset, just as Mike wants. As you discover your Key Performance Environments, be sure to identify YOUR home turf. Whether it’s your home, workplace or your favorite hang out, you can always leverage your home team advantage to create miracles. 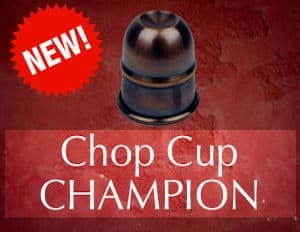 Mike has also identified some wonderful materials he can use to perform impromptu in any restaurant, AND he’s noticed that many of those same materials will be available anytime he goes to dinner parties at the homes of his friends or family. Once you know the Materials you want to use in your magic, and you know they’re a good fit for the real life environments where you want to perform, you’ll have a powerful foundation for your Strategic Astonishment System. Next, we’ll dispel any myths you’ve heard about ‘skill’. You might have a trick selection problem, or a routine problem, or even a presentation problem. But you DO NOT have a skill problem. What if I told you that you NEVER have to perform a ‘difficult’ trick to create astonishing magic? Successful magicians all share one thing, and maybe only one thing, in common. They ONLY perform magic tricks that are actually easy for them to do! And if you perform ONLY tricks that are EASY for YOU to do, you’ll draw a line in the sand - and create the most valuable ‘trick selection filter’ any magician can have. We magicians are constantly bombarded by magic tricks and training that communicate the idea that our ability to astonish depends on having sleight-of-hand mastery, or some fundamental level of skill. If you’ve felt that way, you’re not alone. In fact, I felt that way for about ten years. And guess what? It doesn’t work. It’s flat out wrong. And the idea that you need to finish building an elusive technique arsenal before creating great magic routines has done more to slow, or stop, the growth of passionate magicians than any other idea you’ll find in magic. Because no technique - no matter how advanced - is of any use at all unless it’s used in the context of a trick or routine designed to take audiences on a journey to the ultimate state of ‘Delight’. If a technique you are trying to use is so challenging it requires most of your attention during performance, you will not be able to take your audiences on a journey successfully. Which is why you should NEVER perform a trick that’s difficult for YOU PERSONALLY to do… ever. (For example, for some magicians the double turnover presents a challenge while for others, it is easy. Some people find it very easy to get a break in a deck of cards during performance... other find it difficult). Once you understand the full process of Strategic Astonishment, you’ll discover that in order for you to amaze, you can only rely on magic tricks you can perform with ease. We’ve helped thousands of magicians use the Strategic Astonishment System to start amazing their audiences immediately - without using ANY difficult sleight-of-hand. And we know that over time, practicing magicians DO tend to develop skills that can then be employed under the Strategic Astonishment umbrella to enhance their magic even further. We’ve worked with thousands of magicians who have skills. But without an understanding of Strategic Astonishment, all the skills in the world don’t accomplish a single thing. Practical, reliable amazement comes from knowing how to select the optimum magic tricks and material for a specific Performance Environment - and sharing those tricks in a strategic order that maximizes your audience’s experience of magic. Without a system to guarantee your success, you’re flying without a compass. It’s all trial and error - and blind luck. Sometimes a trick works wonderfully. Other times it falls flat. It all seems random. That’s why you get frustrated. Great magic is not blind luck. And it’s not based on skill. We can teach you easy magic tricks, concepts, and fun presentations - but first you need to understand the system. The goal, no matter what tricks or methods you use, is to drive your audience through your Strategic Astonishment System. 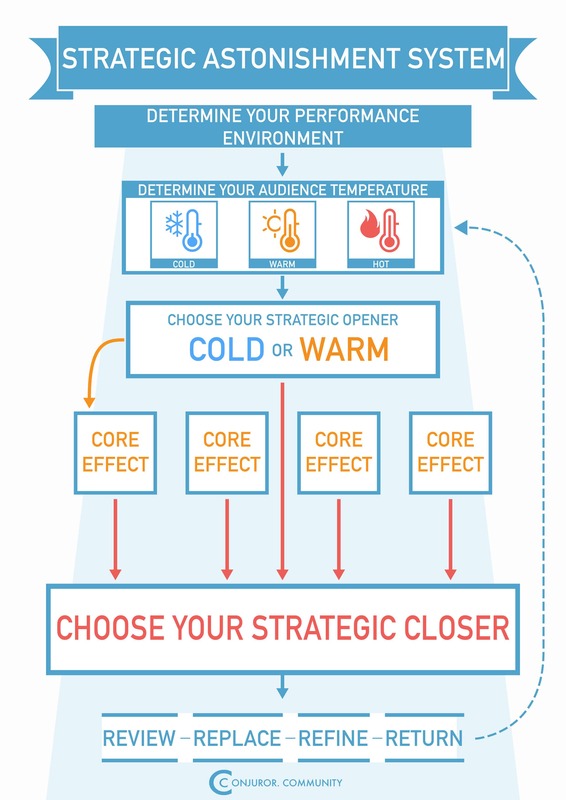 And it all starts by determining your Audience Temperature. Once it’s time to perform, most things have already been decided. You already know what tricks you do. And thanks to your Environment and Available Materials grid, you already know which magic tricks you are able to perform right now. Now you need to be able to figure out your Audience Temperature. Doing this will let you look at an audience in front of you and know what tricks they will respond to. As you choose what trick to perform, an infinite number of factors affect your audience’s mood. Are they hungry? Have they eaten? Are they full and tired? Have they had drinks? Have they had MANY drinks? Knowing your Audience Temperature makes it easy to gauge their interest level and excitement both before and during your magic. With that information, you can choose magic tricks that will most effectively move your audience through your Strategic Astonishment System - from their current ('Before') state - to the desired ‘After’ state (Delight)! 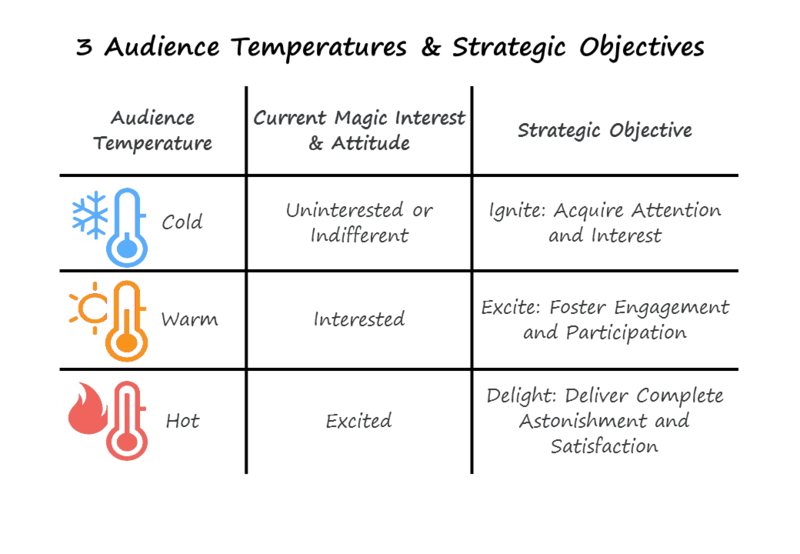 When assessing your Audience's Temperature, go with their center of gravity - the temperature that best describes your whole audience (IE: One very excited person and 3 indifferent people does not equal a Hot audience). If you always keep your coldest audience members in mind as you choose your Opener for any audience, you’ll have an unstoppable strategy you can rely on to ignite ANY audience. 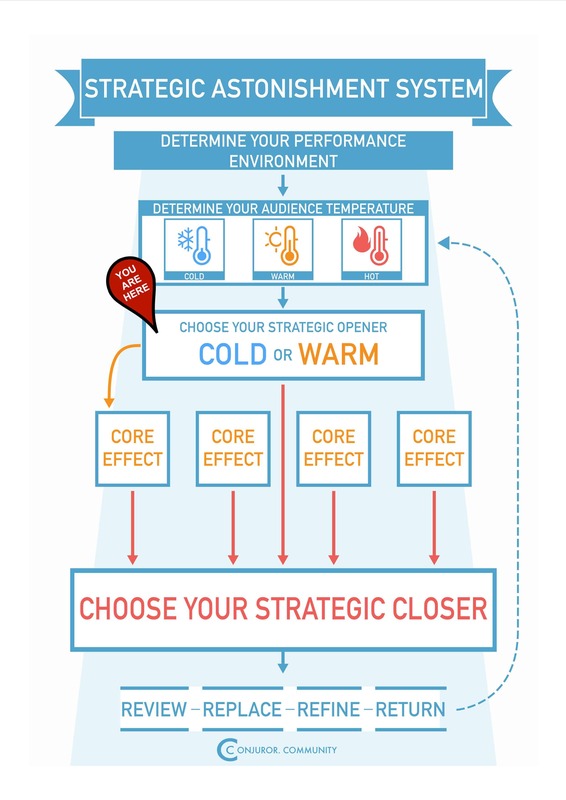 The point of knowing your Audience Temperature is so that you'll know what your Strategic Objective is to get maximum results from every trick you perform. For example, you cannot hope to delight your audience if they are not engaged (excited). And it’s very difficult to actively engage your audience with your magic without igniting their interest and attention. 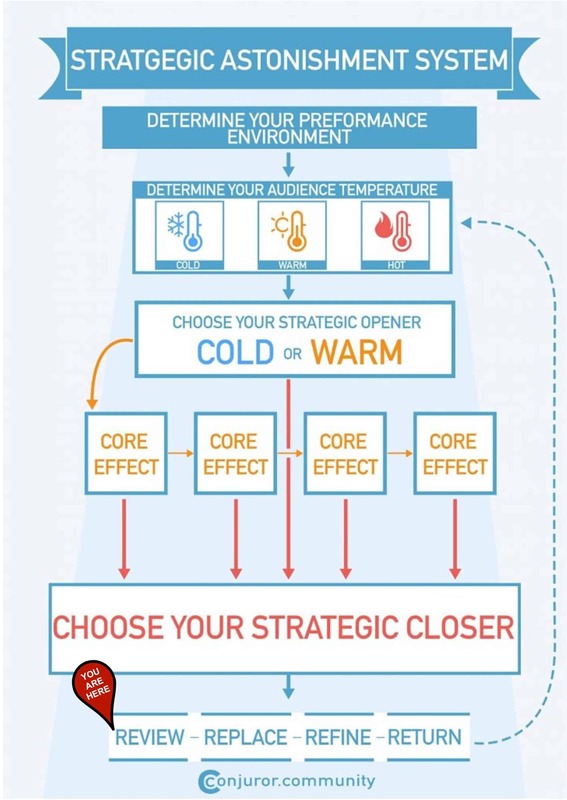 When it comes to choosing the next trick you want to learn, or which of your current tricks to master, your first strategic choice should be ‘Cold Openers’ that work in each of your Key Performance Environments. Once you share a trick that makes an indifferent person interested in your magic, they shift from ‘cold’ to ‘warm’. They become engaged with your magic, and ready to participate - and appreciate - most of the best tricks in magic. Become a master of choosing magic tricks that connect with cold audiences, and you’ll have a reliable strategy for creating warm, receptive audiences with ease anytime you share your magic. Whether you intend to perform a 30-minute show or a single trick, the first trick you perform for any audience is your Opener because, well, it's the first trick. It sets the stage for everything to come. And it’s the most important strategic trick choice you’ll make. Provided your audience is excited enough about your magic, virtually ANY great trick can be a strong Opener. For example, David Blaine and David Berglas are both incredibly famous magicians. 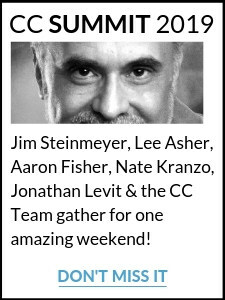 Each of them is renowned for their ability to create a completely satisfying magical experience - even when they perform just one trick. David Blaine performs for audiences who are not just warm, but actually HOT. His audiences aren’t merely interested in David performing. They are very, very excited. He’s performing for people who have an extremely high Audience Temperature. By the time David Blaine performs his first (or only) trick, his audiences are as excited and engaged as an audience can possibly be. That’s why, for David Blaine, one good trick is often enough. That’s how famous magicians deliver complete magical experiences with just one strong trick. Perhaps you’ve had the chance to perform magic for a Cold Audience, where most of the spectators were indifferent, or even disinterested in your magic. In these circumstances, even the strongest trick will fail to achieve its full potential. We’ve all experienced difficulty with Cold Audiences. To solve the problem, I tried, for years, to reach these audiences with my most powerful Closer. It got a strong reaction. But the trick didn’t get nearly same impact as it did as a Closer. Instead of Complete Satisfaction and Delight, I managed to gain my audience’s interest - and their attention. But since I’d performed my strongest Closer, my audience was now ready for the ride and I didn’t have anyplace left to take them. When you perform for a cold audience, you can’t win the whole game - you can only win the Opening. Get the Audience's Attention. Arouse their interest. 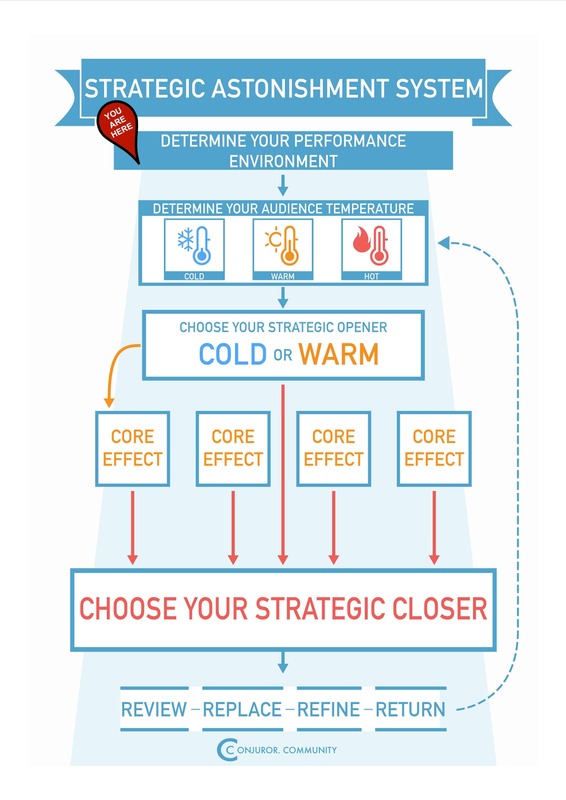 In other words, your Strategic Objective is to transform your Cold Audience into a Warm Audience. Strategic Astonishment Launch Path Stage 1: Ignite! "You can’t start a fire without a spark." There are many great tricks in magic that make lousy Openers. Make no mistake. When you perform for a Cold Audience, they have not expressed real interest in what you’re doing, and it’s likely that you don’t have their undivided attention. Your Cold Opener needs get that attention quickly delivering an extremely surprising and powerful effect. This is the perfect time for a visual effect. Don’t worry. Your Cold Opener doesn’t need to be visual, but it must be direct - and cut straight to the chase. Our Any Card at Any Number training shows an incredibly easy-to-perform trick Juan Tamariz, Asi Wind, David Berglas and many of today’s top magicians love to perform. Our method is easy, but the effect is not direct or surprising. This trick can create drama and suspense, but it takes many minutes to present - and no magic happens until the very end of the routine. You’ll need an attentive, engaged and excited audience to participate as you build this trick to an astonishing climax. It’s a perfect effect for Hot Audiences, but it’s a bad choice for your Cold Opener. 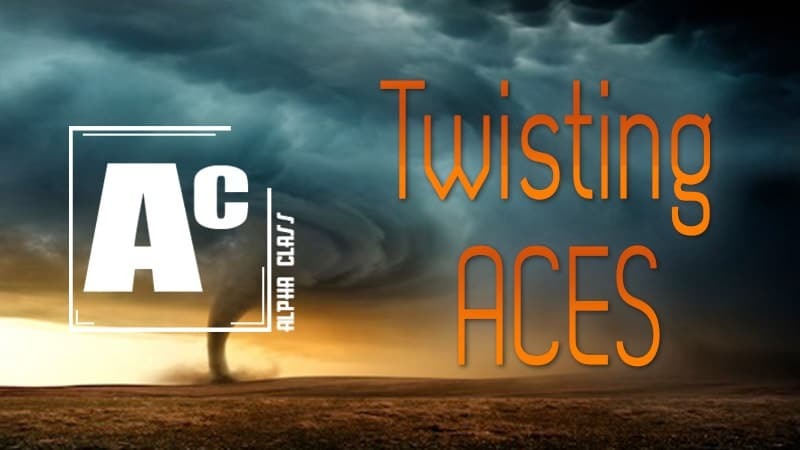 Our Twisting Aces Training shows many incredible features of a classic trick. You can use four ordinary cards to create a four phase miracle that gets better with every stage. But it takes over 30 seconds before the first effect happens - and the first phase isn’t shocking enough to transform a Cold Audience into a warm one! Your Cold Audience is not yet interested enough to want mystery. If you want to perform a card trick, it must be a surprising and direct effect - and there are MANY great Cold Openers with cards. Your cold opener should require little or no explanation to be effective. Your Cold Opener is a great time for a self-explanatory visual miracle. At this stage, don’t worry about what happens in the rest of the routine, if there is one. All that matters is the first effect, how direct and surprising it is - and how quickly you can get to the punch. Strategic Trick Selection dictates you perform for the audience as they are - not as you would like them to be. Most of the time, a Cold Audience is indifferent or disinterested in your magic. Occasionally, you’ll meet audience members who aren’t just disinterested in magic, but actually dislike magic. For professional magicians in particular, these audiences cannot be entirely avoided. However, if you have a Cold Opener or two that avoid cards and coins, you can often surprise and amaze these challenging spectators before they even see you coming. 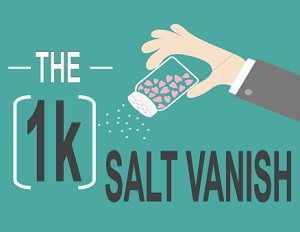 Imagine pouring a large quantity of salt into your hand - and then it vanishes! The magic is direct, astonishing, and happens in less than 30 seconds. And from the moment you start pouring salt into your fist, no one will be able to take their eyes off the action. Keep this in mind as you select your Cold Openers. During the moments leading up to your Opening Effect, the action should be interesting. 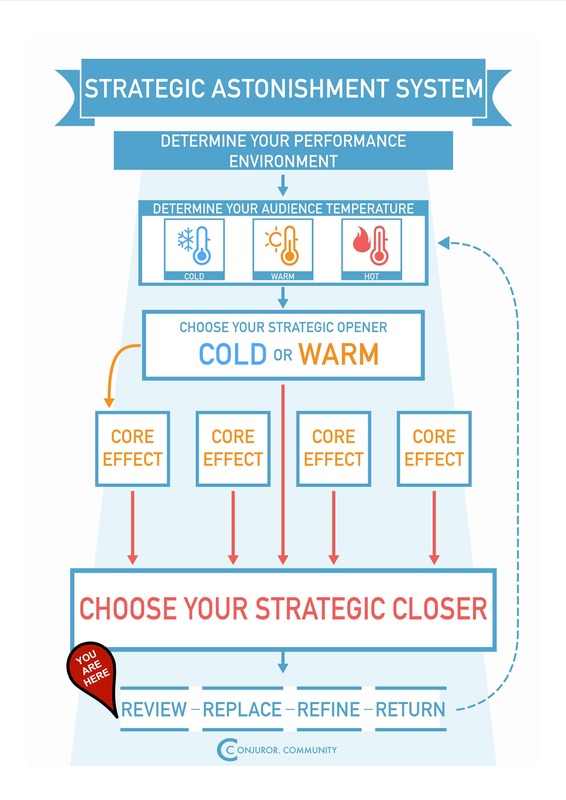 When the audience is Cold, the trick itself must hold your audience’s attention until you get to the payoff! Any Opener should surprise, astonish and arouse your audience. When you have a Warm Audience to begin with, filled with people who are interested in your magic, or who’ve seen you before, you can safely choose an opener with a little more wiggle room. The audience is interested and paying attention - so you have a wider choice of tricks you can perform. 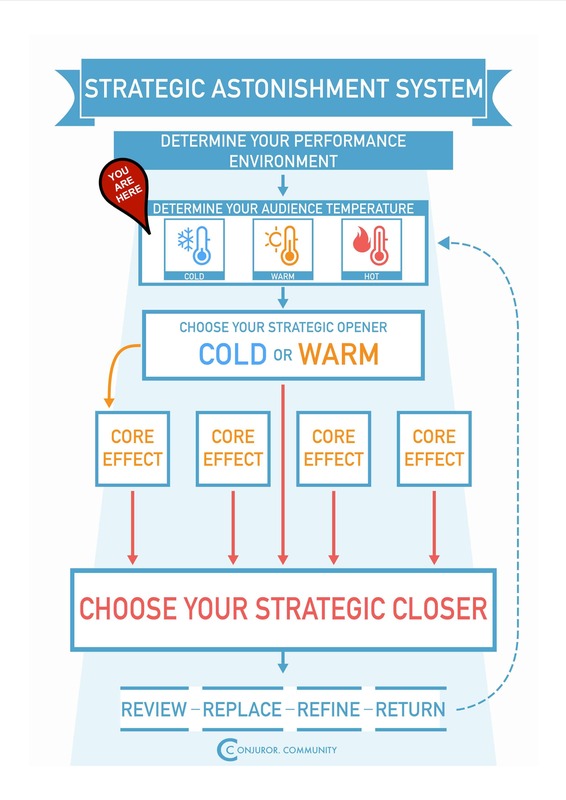 Since you have a Warm Audience, you can move on to your Stage 2 Strategic Objective, and choose a good trick that will engage and excite your audience. Strategic Astonishment Launch Path Stage 2: Excite! Sometimes one trick is enough. If you’ve been put on the spot and asked to perform magic in a loud room for a cold audience, it’s possible you’ll only need a strong opener and you can safely declare your mission is accomplished. But once you taste the success that comes from choosing a strong Cold Audience Opener, you’ll discover something very exciting. After your Opener, you’ll find yourself surrounded by Warm Audiences. More and more often, you’ll want to continue ‘the show’, because your audience will be interested and open to seeing what you’re going to do next. You’ve converted a Cold Audience into a Warm Audience. Now, your Strategic Objective changes. You no longer need to gain the interest of your audience. You already have that. Now you need to choose a trick that will transform them from a Warm Audience into a Hot Audience. To do that, you’ll need to choose tricks that engage and excite. Whether you perform magic close-up or you want to perform onstage, the single most proven way to excite your audiences is to engage them with participatory magic. When the audience only gets to watch the magic, they lose interest quickly. When they actively participate, the magic actually happens to them - and sometimes, they even get to make the magic happen themselves. Remember, every trick or routine you perform between the Opener and the Closer is a ‘Middle’. 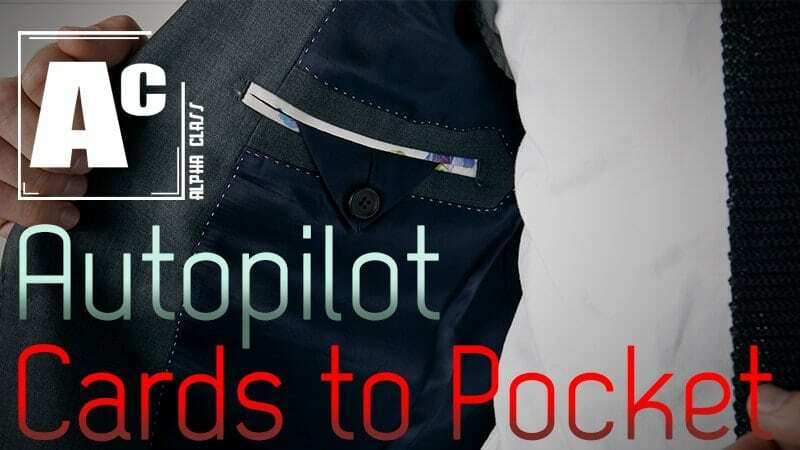 Fortunately, GREAT Middles are very easy to find and choose - they make up most of the wonderful tricks in magic, and it’s likely that most of your favorite tricks to perform right now can be made into Middles that engage and excite your audience. For that reason, we call these tricks your Core Effects. Often times, great magic tricks have audience participation built-in. When you borrow a spectator's hundred-dollar bill and make it vanish, you better believe they feel like they’re a part of the magic. When you ask your spectator to cut the deck four times and let them discover the four Aces, they don’t just participate. They actually perform the magic! But that’s just the beginning. There are several easy ways to use presentation to transform a strong trick into a participatory miracle. Whether you choose physical participation, emotional participation or a combination of both, there are several types of Active Audience Engagement you can use to ensure your audience gets more excitement and joy out of each new trick you perform. As Henning Nelms wrote in his landmark classic Magic and Showmanship, most magic tricks are Demonstrations. The key is to know what you are demonstrating, and why. 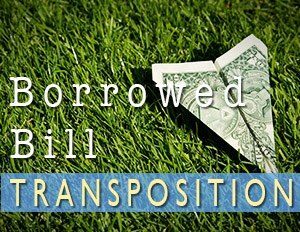 For example, in the incredible Borrowed Bill Transposition, you cause a borrowed bill that’s held in your participant’s closed hand to visibly change places with another bill in plain sight! When you offer a magic trick as an experiment, your audience becomes a participant! 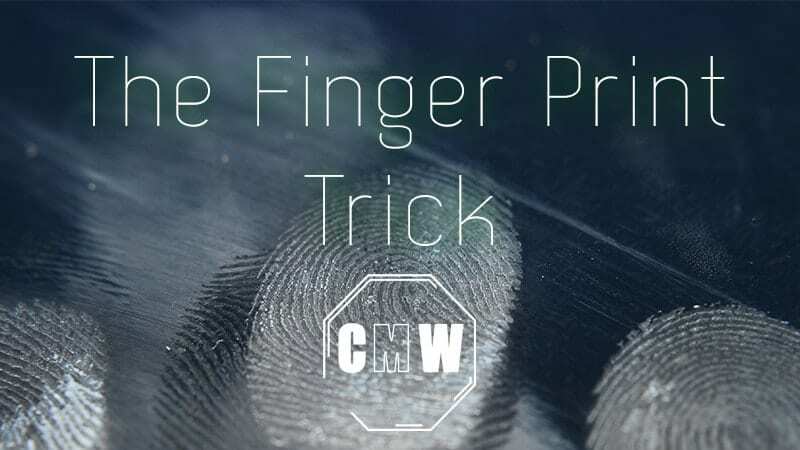 In this approach to one of Dai Vernon’s favorite tricks, a magical card transformation becomes an experiment in forensic science. Experiments tend to be stronger than Demonstrations... because the magician doesn’t pretend to know what the outcome will be! As CC Presentation Expert Rolando Santos is fond of saying, all humans share an instinctive curiosity to ‘peak behind the curtain’ and discover juicy secrets that others don’t know. Turn your trick into a lesson, and a mere ‘spectator’ becomes a student with much to gain! 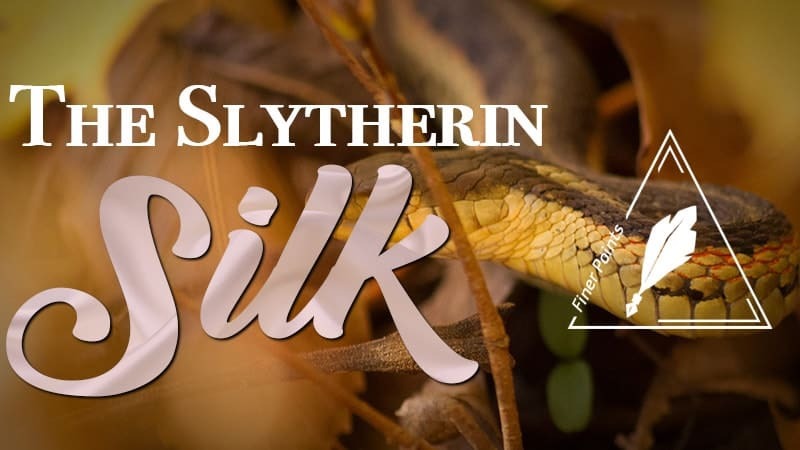 The Color Changing Silks has been a reliable favorite of professional magicians for the better part of a century - in large part because the presentation features a ‘Magic Lesson' ...and the audience gets hooked every time. We LOVE this trick so much we did a major workshop on it. Many of the strongest tricks leave room for you to choose from more than one type of Active Audience Engagement. 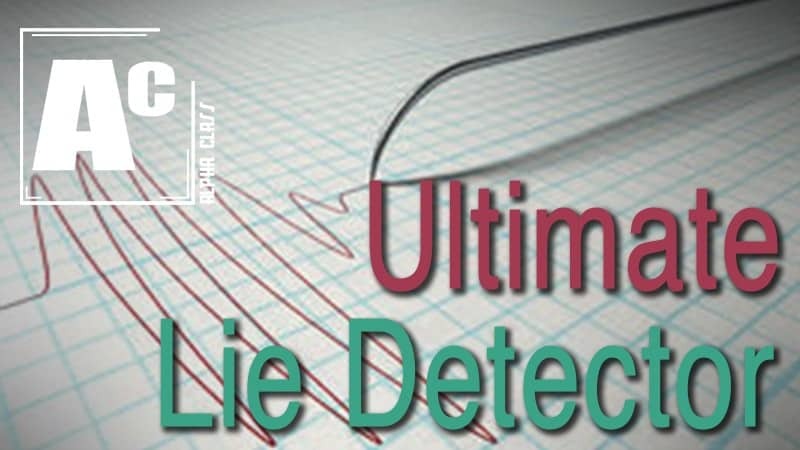 For example, we love this impossibly easy, diabolical approach to the Lie Detector Plot. You can frame this flexible fooler as an experiment in modern lie detection - or a lesson in how to ‘beat the machine’! One of the most powerful ways to create Active Audience Engagement is to play a game. It’s one of the most effective ways to engage your audience in a fun, non-confrontational way. 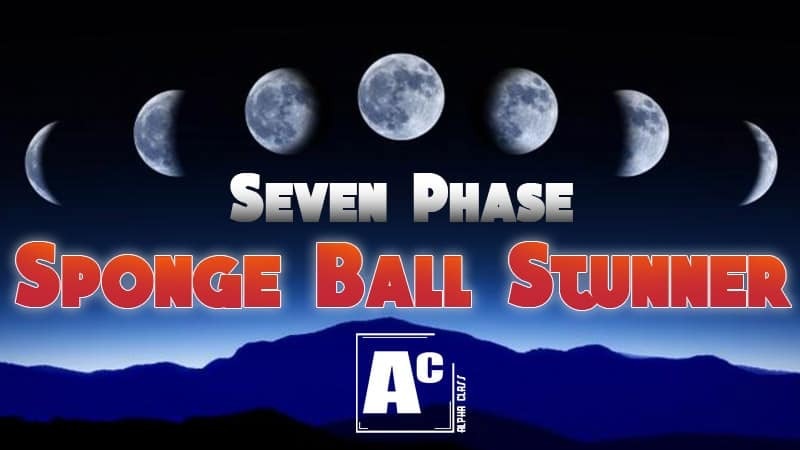 The 7 Phase Sponge Ball Stunner can be just as amazing with balled-up napkins as with sponge balls. Because this trick is positioned as a guessing game, the audience doesn’t just watch... they play! Once you have the audience's interest, presenting a trick as a story is a great way to create Active Audience Engagement. When we listen to a good story, we ARE actively engaged! For example, you can tell a story about a game! When we perform our favorite versions of the 3 Card Monte, we love to tell a story about a game that we once witnessed. This is a powerful way to engage your audience without asking them to play a game they can’t win! Get Full Access To All The Above Tricks! You can safely end your set after one Core Effect. Or you can continue to engage and excite your new fans with two, three or more Core Effects and Routines. As long as you choose tricks that engage and excite your audience, you’ll find your Audience Temperature will continue to rise. Even though you can bring your show to a satisfying conclusion, for the purposes of Maximum Strategic Astonishment, you’ll want to keep one of your favorite routines in reserve. That will allow you to enjoy the show, thrill your audiences, and discover the Peak Temperature of your audience. Now, it’s time for your Strategic Closer. Strategic Astonishment Launch Path Stage 3: Delight! Once you adopt a strategic approach to trick selection and routine building, you'll discover that many tricks can be used in different positions. Many great Openers, for example, can also function as Closers. Sure, it’s a great idea to save your best stuff for last, but from a practical perspective, you’ll often discover that you don’t need a new trick to create a satisfying finish to your show. The reason for this is simple. By the time you’ve gained an audience's interest and attention, and used great tricks designed to engage and excite them, you’ve transformed them into a Hot Audience. Your audience is now open, receptive, and positively excited to see whatever you want to perform. In most cases, the biggest challenge you’ll face now is an audience that doesn’t want the magic to stop. Of course, you’ll want an amazing trick or routine. But for your Strategic Closer to hit just the right notes of culmination, choose and present your last trick in a way that leaves the audience with a sense of completeness and satisfaction. The secret to offering your audience a totally satisfying finish is to leverage the high level of interest and excitement you’ve generated to create a completely satisfying, even exhilarating, experience. Fortunately, the secrets to doing that aren’t nearly as mysterious as you may believe, and Strategic Astonishment holds the key. For example, Juan Tamariz is widely considered to be the greatest living magician today. A few years back, I visited him in Spain to see his two-hour public show. During the show, he did stand-up magic, mentalism and even mind-reading with cards as he stood before the audience. Then, to finish the show, he brought a spectator on stage to sit beside him at the table. Working close-up, I’ve never heard of Juan standing - he ALWAYS sits at a table. But in a grand show for the public, he waited until the very end to sit. Why? 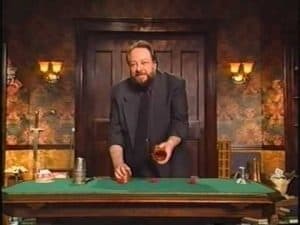 Ricky Jay performed his critically acclaimed Broadway Show Ricky Jay and his 52 Assistant to packed houses for many years. His entire show used playing cards, but then, to close, he chose to perform the Cups and Balls. Both tricks above also include built-in escalation featuring a very powerful concept that was most effectively explained in Tamariz’s book, The Magic Way. Both routines start with a simple magical effect and then repeat it under increasingly impossible conditions. Every possible method is slowly stripped away, until the audience experiences the something that’s truly impossible. A trick that features The Magic Way can work anytime you have a Warm Audience, but these examples show how the very best magicians use this this strategy to its fullest effect with Hot Audiences. Wait until your audience is highly interested and very excited, and it’s a safe bet you’ll have the Audience Attention Resources you need to take them on the kind of multi-stage journey that creates a powerful payoff. And you don’t have to have the experience or skills of Juan Tamariz or Ricky Jay to provide YOUR audiences with the same kinds of Contrast and Escalation. 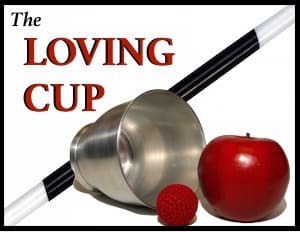 For example, you can perform a nearly self-working Cup & Ball Routine that provides the same miracle effect (including the big finale) - without all the hard work. While a Strategic Closer can be a multi-stage routine, it doesn’t have to be. Your Strategic Closer doesn’t have to use sleight-of-hand either. In fact, ANY new element of interest can create the contrast you need to make a powerful closing routine. In my own work, I spent over a decade performing a professional show using only a single deck of cards. The Invisible or Brainwave Deck - often sealed in an envelope, allowed me to create an added layer of impossibility, and contrast. Second Sight - which allowed me to create MASSIVE contrast by introducing just one card from outside the pack to create a show-stopping miracle. A New Deck - with a different color, which would allow me to perform Any Card at Any Number... one of the strongest card tricks ever created, provided you have a Hot Audience. Just about any contrast is sufficient to power your transition to a satisfying closer. You can also create powerful contrast by choosing a Presentation Style you haven’t already highlighted in your set. For example, take a look at most of your go-to tricks. If one of your tricks plays as a Lesson and the rest do not, you can easily provide strong Contrast, and Connection (more on connection below), by offering the audience a glimpse behind the curtain and teaching a lesson in your final trick. Games, Experiments and Lessons all get strong results if they provide a contrast to what has come before. Are you one of the many magicians that feels uncomfortable using ‘story patter’? If so, you’re not alone. In fact, as a Strategic Closing Strategy, the story isn’t the patter you use for your trick. The story is a means of creating contrast and escalation to connect with your audience. No matter whether you started the show with an audience that was cold or warm, now they’re hot. They’re excited and interested in your magic. They’re also probably curious to know how you came to be a magician, and what’s been fueling the incredible experience you’ve been providing during the show. Books have been written on the topic of ‘giving magic meaning’. Fortunately, magic already has meaning. But if you’re looking for an easy way to inject connection and meaning into your magic, try using the ‘As-If’ Exercise. All these ideas provide simple metaphors for many popular tricks in magic. Just give the simple list above another read-through, and you’ll be able to think of one, or maybe more, tricks that I might have been thinking of when I wrote the list. This can be an experience that happened TO you directly - or one you read about, heard about, or experienced. You can even make one up! But for the best results and audience connection, find an authentic ‘as-if’ from your own life. If you need inspiration, just look at the list above. It’s a guarantee that any of those experiences have the power to remind you of something you’ve seen, read, or directly experienced. Once you have an idea in mind, try sharing that experience - simply and honestly - before you perform your final trick. You’ll feel incredible new levels of audience connection and satisfaction and you may discover your audience finds the trick itself more amazing, too. Don’t be surprised if the presentation bug catches you - before you know it, you’ll want to add an ‘as-if’ moment before every trick you perform. After your performance, it’s time to run your Success Cycle (Review, Replace, Refine, Return) to ensure your results get more and more magical each and every time you share your magic. Your audiences will give you most of the information you need. And once you’ve implemented Strategic Astonishment to make your choices, you’ll easily be able to assess what went well during your performance, and where there were problems. We all make mistakes and have slip-ups in our magic. Most audience feedback is unspoken - so pay attention to what they may say and listen carefully for what they really MEAN. If your feedback tells you that you need easier methods - or more cover to make sure your secret methods are protected - you’ll need to Refine or Replace something. Aside from that, you can spend most of your energy considering how well your tricks, routines and presentation served your various Strategic Objectives. How well did your Strategic Opener work to get the audience's attention and gain interest? Did your Core Effect(s) excite your audience? How well did your middle tricks foster participation and Active Audience Engagement? 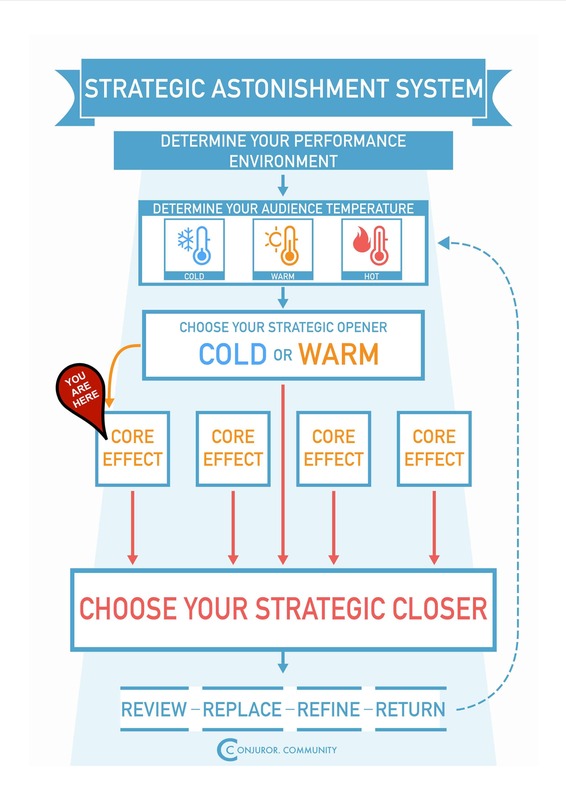 Did your Strategic Closer leave your audience with feelings of completion and satisfaction? Did you provide enough Contrast, Escalation and Connection? Most of the time, you’ll discover some areas where you’d like to see stronger results. That’s a major reason magic stays interesting for a lifetime: there’s always something fun and interesting to accomplish. *Was the trick a poor choice for my Strategic Objective? *Did I merely make a mistake - can I practice it or fix it easily? *Do I need to Refine or Replace a method, a phase, or an entire routine? *Can I simply remove a phase or problematic element and solve the problem? *Did my presentations receive enough energy and attention? Can I get better results simply by giving more energy to the audience? *Do I need to Refine or Replace my presentations to more actively engage the audience? At first, these questions may be challenging. And there’s no substitute for seeking the input of your fellow passionate magicians, and even coaches, for help discovering how to perfect your own personal path to astonishing magic. Start with a Strategic Approach and you’ll be sure to have the biggest, most important elements of success in place from the very beginning. Each time you Review a performance, Refine what you can, and Replace what you can’t refine, and you’ll discover more power in every trick - and in your entire show. Did you enjoy this article? Take a moment and share it with your friends by using one of the share buttons below. After that, leave a comment and let us know if this article helped you!